The bones are the remains of horse, bison, mammoths, and other Ice Age fauna, originally excavated from the Bluefish Caves near the border of Alaska and the Yukon Territory in the 1970s and 1980s. Back then, radiocarbon dating placed the bones at about 25, 000 years old — not in itself surprising, except that many of the bones appeared to have been butchered by humans. And the earliest evidence of human activity on the continent — at least at the time — dated back a mere 14,000 years. Anthropologist Lauriane Bourgeon at the University of Montreal has devoted her doctoral thesis to revisiting the controversy surrounding the Bluefish Caves bones. And she has concluded that more than a dozen of the animal bones do indeed bear “indisputable evidence of butchery activity,” showing that humans were on the continent well before the end of the last Ice Age. The implications of these findings are weighty, not only for the timing of the peopling of the Americas, but for the way in which people actually moved from Asia into what’s known as Eastern Beringia — the swath of North America immediately east of the Bering Strait. The caves were first excavated by Canadian archaeologist Jacques Cinq-Mars starting in 1977, who posited, based on radiocarbon dating at the time, that the scored and damaged animal bones were evidence of human activity in the Americas as much as 25,000 years ago. Largely dismissed and later overlooked, the theory was recently taken up by Bourgeon. In 2015, she published some of her preliminary findings, after having studied 5,600 bone fragments from Cave 2 of the Bluefish Caves. Most of the scoring and hatching marks on the bones were made by scavenging animals and not humans, she said. But at least two of the bones did betray the tell-tale signs of human butchery, she said, including the pelvis bone of a caribou that bore deep, parallel lines etched in them. “That is typically the mark of a stone tool used to de-flesh or disarticulate a carcass,” she told Western Digs at the time. But the oldest of the samples that she tested was no more than 14,000 years old. Today, she and her team have obtained even more impressive results. Bourgeon’s full study covered 36,000 bones from Caves 1 and 2, studying them under a high-power microscope and comparing them to other bones that had been scarred by animals, broken by freeze-thaw cycles, or damaged by rockfall or other natural sources of abrasion. Unlike carnivore teeth, which leave wide, shallow, U-shaped depressions, these samples bore the signature of a hand-held tool, they assert. 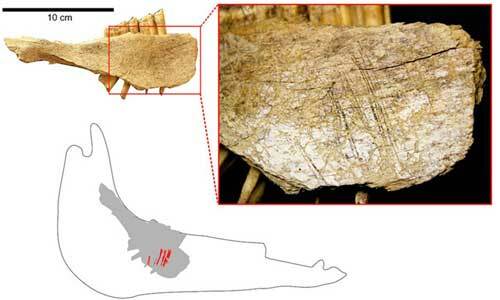 “Series of straight, V-shaped lines on the surface of the bones were made by stone tools used to skin animals,” said Montreal’s Dr. Ariane Burke, adviser to Bourgeon and a co-author of the new study, in a press statement. The team also conducted its own series of radiocarbon tests on six of the bones with the butchery marks. The youngest specimen was 12,000 years old and the oldest — the lower jaw of an extinct horse, said to have marks showing where its tongue was cut out — was 24,000 years old. Taken together, these two data points suggest that Ice Age Alaska and Yukon were not only inhabited, the team asserts, but that it was inhabited by a genetically isolated population, because 24,000 years ago, the rest of the continent was covered in glaciers and impassable. This idea — known as the Beringia standstill hypothesis — has been proposed by some geneticists, who have found molecular clues in the DNA of indigenous groups both east and west of the Bering Strait which suggest that the Americas’ earliest settlers lingered in Eastern Beringia for thousands of years before being able to migrate south. 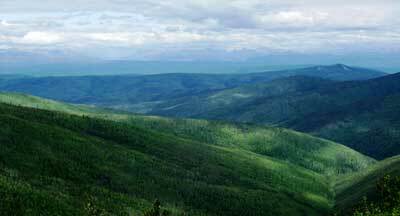 “Our discovery confirms the ‘Beringian standstill hypothesis,’” said Burke in the statement. “Genetic isolation would have corresponded to geographical isolation. “During the Last Glacial Maximum, Beringia was isolated from the rest of North America by glaciers and steppes too inhospitable for human occupation to the West. A growing body of evidence has been discovered since the ‘70s that shows a substantial human presence in the Americas before 14,000 years ago. But there’s limited archaeological evidence to suggest that the continent was populated a full 25,000 years ago. To that, Bourgeon and her team say, future research must focus on both archaeological and genetic evidence, specifically in the region around the Bering Strait, in order to get to the bottom of how and when the continent was populated. “More research effort is required in Beringia clearly, to substantiate the existence of a standstill population and fully understand the prehistory of the first people of the Americas,” they write.